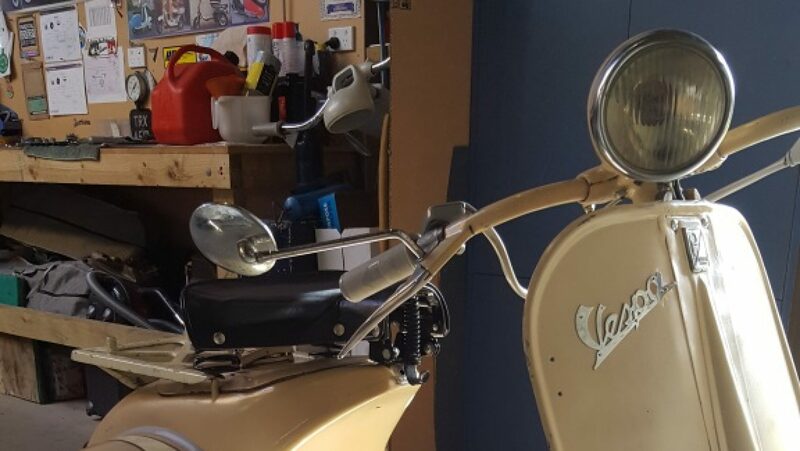 I had tried another tank off a Yamaha SR250 that a friend had loaned me and it looked good but didn’t fit and wasn’t going to fit without modifying both the tank and the frame. I then found a tank on TM that was off a Honda CB900F that was in great condition, cheap and had a huge tunnel. It actually fitted really well and looked good but was just too long for the frame. A tank off another project, a Suzuki AX100, was next on and it looked very good and fitted well but was just too short and will be needed for the project anyway but it gave me a good idea of what I was actually looking for. Eventually I found another tank on TM that was off a Honda (not sure of the year but maybe a mid 70’s CB road bike). It was in rough condition with a couple of dents but complete and had a large tunnel similar to the CB900F. It fitted straight on, looked good and I was able to make a new front mounting point out of some threaded bar and four nuts to use with the original rubber mounts to get the bottom of the tank reasonably level. There is still quite a lot of work to do on the “new” tank as it will need to be stripped and rust treated inside and either painted or maybe wrapped. I’m now also thinking about a seat and how that will mount and look like. 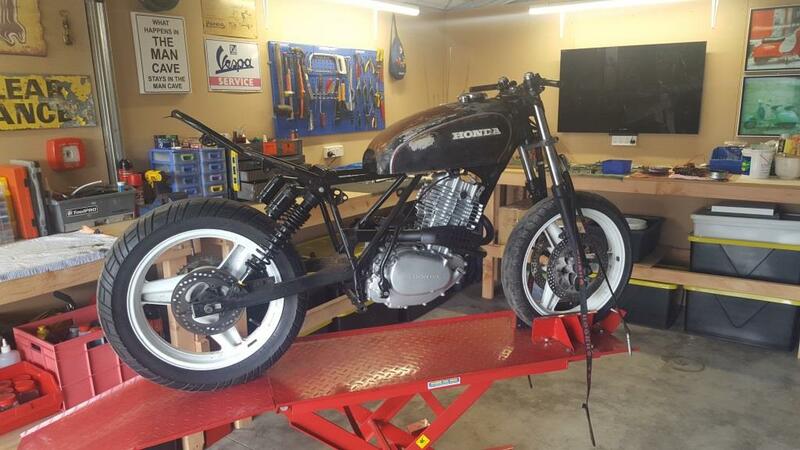 The rear of the frame will have to be cut and changed to suit as it sticks way up in the air at the moment plus I cant make the rear tank bracket until I know where the seat will attach at the front. Hopefully I can get the line of the new seat to continue at the same level as the bottom of the tank but the frame may not allow that.